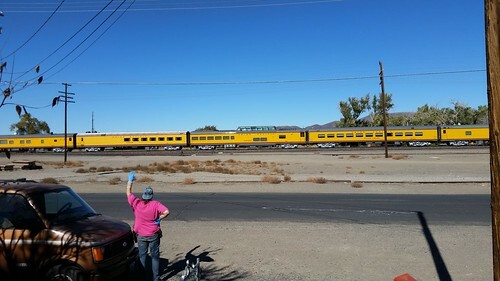 This afternoon, I thought I heard the train dispatcher telling a local train that they needed to get out of the way because of a "business car special coming out of Sparks." 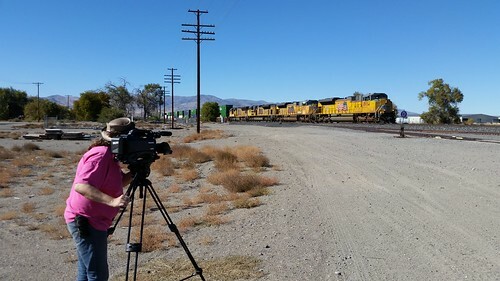 I told Lisa, and she decided to get out the big camera and get footage of it coming through Fernley. She set up for the shot, and I went and spotted for her, signaling to her when I saw the headlight of the train approaching West Fernley. But to our surprise it turned out to be, not the business car train, but a "Z" train (priority intermodal). She went ahead and shot the footage anyway, and afterwards I carried the tripod back to the house for her. On the assumption that I'd misheard the dispatcher, I went back to Day Jobbe and Lisa started getting ready to paint the north end of the porch that she prepped yesterday. Then she came in and said, "I hear another train coming." Sure enough, it was the Business Train, coming through at passenger speeds. (Click through the photo above to see other pictures of the same train.) But because I wasn't ready for it, I couldn't even shoot cell-phone video and thus missed one of the UP "heritage" locomotives on the point. By the time I had the camera armed, the head end was already past the freight cars in the House Track. I apologized to Lisa. I had heard nothing else about this train on the radio, and unlike Amtrak, there's no way for me to track trains like this. Furthermore, with that train pounding away at 70 MPH, there was no way I could have hopped in the car and got ahead of it, aside possibly by trying to roar up I-80 to the US-95 junction some 40 miles east of here, which didn't seem worthwhile. Given where we live, we'll probably see this train again.